In the world of adults, the Supreme Court has upheld a travel ban from some mostly Muslim nations, and refugee arrivals from Syria as well as other Middle East hot spots have slowed to a trickle. Political leaders claim refugees are a threat. But in the world of children's literature, there's a new trend towards putting stories about resilient young Muslim refugees front and center. More than a dozen books are due out this fall, from picture books for toddlers to complex novels for the teen audience. The new crop adds to a growing list of titles that present a positive image of refugees, humanizing and personalizing the ongoing conflicts, says Vicky Smith, children's editor at Kirkus Reviews. "It is a real desire on the part of authors, illustrators and publishers to respond to the crisis in a way that is proactive and helpful," she says. The wave of children's books about refugees comes amid the largest refugee crisis since World War II, as millions of civilians — many of them children — flee wars and insurgencies in Syria, Afghanistan and Iraq. Another wave of the displaced are unaccompanied children fleeing towards the southern U.S. border to escape violence in Central America. "Both of those events have triggered a rush of books dealing with refugees," Smith says. "The trend started in about 2015 and it's just been growing every year." These new novels explore the trauma of war and violence from a child's point of view — everything from treacherous sea journeys to encounters with smugglers and overcoming Islamophobia or other forms of bigotry when starting over in a new country. "We are hearing from our branch libraries, kids and parents are looking for these stories, " says Stephanie Anderson, assistant director of selection at the New York Public Library and Brooklyn Public Library. "I think there is a trend, and a huge readership." It's also a way to push back against a political climate that demonizes refugees and Muslims, says Laura Simeon, who's the Young Adult editor at Kirkus. "The industry is paying attention. There is a real sense that we need to resist. And this is one of the ways we can help with the resistance." In A Land of Permanent Goodbyes, CNN journalist Atia Abawi writes about a Syrian family that escapes their ISIS-controlled town for Istanbul, and then a perilous sea journey on an overcrowded boat to Greece. Suzanne Del Rizzo's picture book, My Beautiful Birds, follows Sami, a Syrian boy who leaves behind his beloved trained pigeons when his family flees to a refugee camp in Jordan; he eventually finds comfort in caring for wild birds in the camp. The latest popular title, Marwan's Journey, was published in May. "The text is so lyrical and so beautiful, without being heavy handed," says Deborah Sloan — she's in charge of marketing this picture book about a young boy on a perilous journey. Sloan says sales have been so strong there is already a second printing. Author Alan Gratz is often credited with starting the trend with his book Refugee, a surprise New York Times best-seller in 2017. "The lives of refugees are so dangerous and so overwhelming, and so incredible that I don't have to make anything up," he says. The lives of refugees are more incredible than fiction." His novel weaves together the stories of three children: A Jewish boy whose family tried to escape Nazi Germany on a ship called the St. Louis in the 1940's; a Cuban girl who flees Havana on a raft in 1994 and Mahmoud, a Syrian boy who escapes war-torn Aleppo on a journey to Europe with his family. "Refugee was trying to put what's happening in the present day in some sort of historical context," says Gratz. "We keep making the same mistakes ... generation after generation, we keep turning people away at the doorstep who need help." Refugee is popular with teachers and librarians as a way to explain the current crisis to children. Gratz has been invited to speak across the country — he says he visited more than 100 schools in the last school year, and he's booked for 100 more next year. "I go to some schools where they have an 85% refugee population. They're seeing it, they're living it, they're feeling it," he says. His aim in writing the character 12-year-old Mahmoud Bishara is to show that his young Syrian protagonist is just like the American middle-schoolers who are reading his story. "He is watching Teenage Mutant Ninja Turtles on TV. He is doing math homework for school. He hopes to go to college," Gratz says. "Then bombs fell on [his family's] house, and they became refugees." Robin Russell teaches seventh grade humanities at the Open Window School in Bellevue, Wash., and she assigns many of the refugee novels to her class. "It's not just about memorizing facts," she says. "Establishing a connection ... it makes it more personal and you can connect through your own humanity with someone else." Her students gathered for a recent Skype interview to talk about what they learned. Rayhan Khanna says the characters in Refugee "were from different parts of the world but they were all interconnected through this way of seeking a better life." Classmate Tendo Lumala says the novels showed him that it's hard to be a refugee, because you have to make tough decisions. "It's not because you're doing something wrong, it's because of your situation and entirely not your fault." And Rachel Hines says these novels about refugees helped her understand the crisis for the first time. "I realized that the stereotype isn't true." With so many ongoing conflicts, there are now books that illuminate the refugee experience across the world and throughout history. Linda Sue Park's A Long Walk to Water tells the story of an 11-year-old Sudanese girl in 2008 who has to walk miles each day for water, and one of the "lost boys," on a trek to a refugee camp in 1985. There are books about Hmong refugees, Nigerians and an English child sent to Canada for safety during World War II. But educator Rosetta Eun Ryong Lee says the wave of new novels is sometime considered too politically hot for the classroom. "I find it sad that we are not allowed to tell these stories of everybody," she says. Lee is an outreach specialist for a group of schools across the country, and, she adds, "some schools say this is too hot of a topic to touch." Alan Gratz says he welcomes invitations to schools with a skeptical audience. "I visit the South particularly, the rural South quite a lot and that's a tough sell, sometimes," he says. "I go in, sometimes somebody has already looked me up and they're challenging me on social media before I ever get to their school." He is an engaging speaker, who challenges students to question their assumptions. "They're repeating things that they've heard from their family, or from the news, or from their local community. I can get in there and I can say, 'Wait, wait, wait, read this book, let's talk about what's really going on.'" "If they keep those opinions, that's their prerogative," Gratz says, "but I know that people have had their minds changed by books about refugees for kids." This story was edited for radio by Larry Kaplow, produced by Claudette Lindsay-Habermann, and adapted for the Web by Petra Mayer. Literature often reflects the times in which we live. And there's a recent trend in literature for young people that deals with one of the world's biggest crises - the global wave of refugees. Now, books that tell the story of the refugee experience have become something of a genre. NPR's Deborah Amos has this story. DEBORAH AMOS, BYLINE: In Bellevue, Wash., this seventh-grade class gathers one more time before summer vacation, and I listen in on Skype. AMOS: That's Robin Russell. She teaches seventh-grade humanities at the Open Window School. All of her students read about refugees this year. RUSSELL: I would like to introduce you to my students. AMOS: The new crop of refugee stories explores the trauma of war and violence from a child's point of view. RACHAEL HINES: I'm Rachael, and I read "A Long Walk To Water." SIMMER: I'm Simmer, and I read "Child Of Dandelions." RAYHAN KHANNA: I'm Rayhan, and I read "Refugee." TENDO LUMALA: I'm Tendo, and I read "American Embassy." 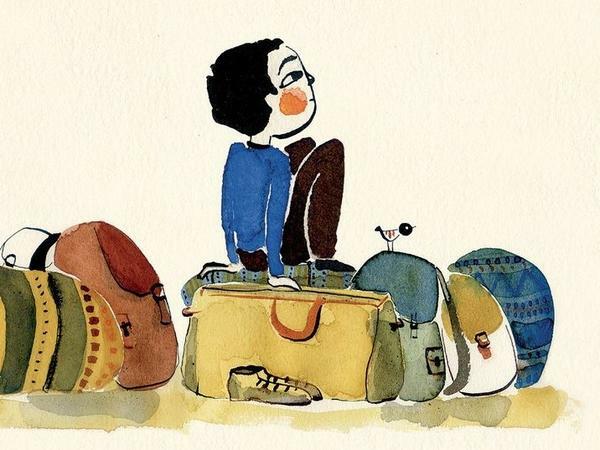 AMOS: These novels and picture books portray treacherous sea journeys, encounters with smugglers, dangerous border crossings and overcoming bigotry when starting over in a new country. Russell says the stories are dramatic, and they're personal. RUSSELL: And so it's not just about memorizing facts of where conflict is in the world, but your goal is for students to make personal connections with the material. AMOS: A popular title published in May is "Marwan's Journey." As the reviews describe, Marwan is a young boy on a journey he never intended to take, bound for a place he doesn't know. DEBORAH SLOAN: (Reading) I take giant steps even though I am small. I walk, and my footsteps leave a trace of ancient stories, the songs of my homeland and the smell of tea and bread, jasmine and earth. AMOS: That's Deborah Sloan - in charge of marketing "Marwan's Journey." She says sales have been so strong, there's already a second printing. SLOAN: The text is so lyrical and so beautiful without being heavy-handed. AMOS: This trend in children's books comes as millions of civilians, many of them children, are fleeing wars and insurgencies in Syria, Afghanistan and Iraq. Another wave of displaced are children coming from Central America. VICKY SMITH: Both of those events have triggered a rush of books dealing with refugees, and the trend started in about 2015, and it's just been growing every year. AMOS: Vicky Smith, children's editor at Kirkus Reviews, says book authors are responding by humanizing refugees as politicians portray them as threats. SMITH: So it's motivated my sense of it anyway - it's motivated less for profit than it is - they all seem really designed to create empathy. AMOS: Here's an excerpt from Alan Gratz's book "Refugee," a New York Times best-seller in 2017. It's about a 12-year-old boy named Mahmoud Bishara, and he's from Aleppo, Syria. ALAN GRATZ: (Reading) One of the soldiers stood in front of the car, his rifle aimed loosely at the windshield, while the others walked around the sides, peering in through the windows. The soldiers were silent, and Mahmoud closed his eyes tight, waiting for the shots to come. AMOS: Gratz says he wanted to put what's happening in the present day into a historical context. GRATZ: We keep making these same mistakes, that we keep turning people away at the doorstep who need help. AMOS: He weaves the stories of three children - from the 1930s, a Jewish boy whose family tried to escape Nazi Germany; in the 1970s, a Cuban girl's exodus from Havana and 12-year-old Mahmoud fleeing war with his family. The book is popular with teen readers who hear the news about refugees and some who've experienced it firsthand. GRATZ: Many of them go to school with kids who've been through this. I go to some schools where they have, like, an 85 percent refugee population. AMOS: Gratz was once a middle school teacher, and he welcomes the challenge of kids who are skeptical, repeating what they've heard from their parents. GRATZ: And I can get in there, and I can say, wait, wait, wait. Read this book. Let's talk about what's really going on. And if they keep those opinions, that's their prerogative. But I know that people have had their minds changed by books about refugees for kids. AMOS: He was invited to speak in more than a hundred schools last year. He'll be in a hundred more in the next school year. Deborah Amos, NPR News. (SOUNDBITE OF TRISTAN DE LIEGE'S "SHE CHANGES") Transcript provided by NPR, Copyright NPR.